It happens to so many families… The sky’s the limit for the first nursery, which could have been ripped directly from The Land of Nod, or the Lopez-Anthony baby boudoir… Then baby two comes along and *screeeeeech! * – the budget hits a wall, and everything is from IKEA, Craigslist, or grandma’s attic. You can still dream big – just buy small with Hape’s Trendy Nursery dollhouse furniture. It’s everything you’ve ever wanted in a modern babyspace, just at 1/10th the size and pricetag. 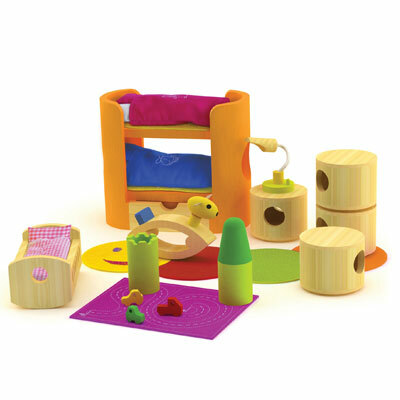 A mere $39.99 at Oompa Toys, the Trendy Nursery is made mostly of bamboo and includes: 1 bunk bed with pillows/blankets, 4 cubby hole cylinder units, 1 rocking crib with pillow/blanket, 1 rocking horse, 1 lamp, 4 rugs, 1 road playmat with 3 cars, and 1 castle toy. And your child will play with it long after they’ve outgrown the life-sized versions. If you let them.